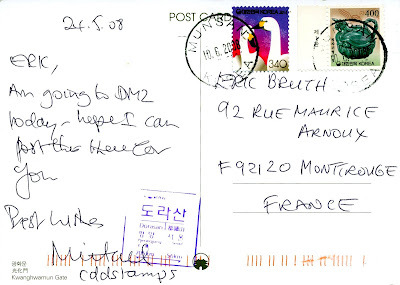 I recently got two postcards and one letter from Korea, sent by Michael, that I would like to share with you. Thank you Michael, and thanks a lot for the frog stamps that were included in the letter ! Let’s start by the postcards. The first one pictures Gwanghwamun (or Kwanghwamun) gate, which is a gate located in central Seoul. It was built in 1395 in front of the Gyeongbok Palace, a very large palace built in 1394 by King Taejo. 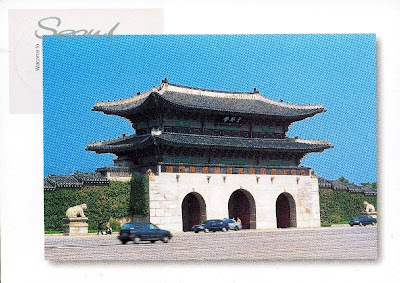 The Gwanghwamun gate has been destroyed and rebuilt several times since its construction, it has even been actually moved in 1926 during the Japanese occupation to face what is now the Folk Museum of Korea ! The plan is to renovate it and to move it back to its original location ! Works should be finished in 2009. Here is the other side of this postcard. 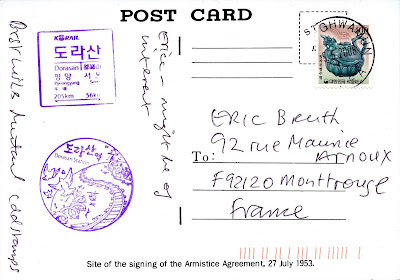 Both stamps used on the postcard are definitive issue. The one on the left is part of a set issued on the 1st of November 2006 as a part of the adjustment of the postal rates that took place at this time. The stamp pictures a couple of whistling swans. This winter migratory bird as been designated as Natural Monument of Korea. The other stamp has been issued on the 11th of April 2003 and pictures a celadon pitcher in the shape of a tortoise. The turtle-shaped pitcher was produced during the Goryeo Kingdom in the early 12th century and displays the sophisticated craftsmanship of the times. It is 17.3 centimeters high and is preserved at the National Museum of Korea. You can notice a blue mark on the left side of the cover, I will come back to it with the second postcard. It pictures the site of the signing of the armistice agreement on the 27th of July 1953 that put en end to the Korean war. Here is the other side of the card. You can see two blue mark on the left side of the card. The first one is the mark of the Dorasan station. 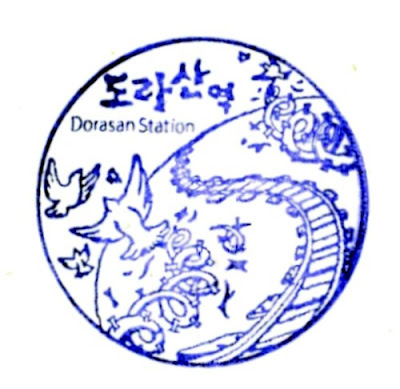 Dorasan station is located on Gyeongui line, one of the oldest railway lines in Korea. It opened in 1906 and connected Seoul to Pyeongyang. After the division of Korea in two parts, the line was also divided in two. On the south part, the trains stop at Dorasan station, located on the edge of the DMZ (Demilitarized Zone). There is a plan to re-establish the full line as it was originally between North and South Korea. 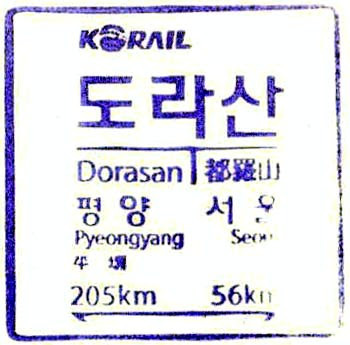 To symbolize this plan, there is a milestone at Dorasan station indicating the distance from there to Seoul and to Pyeongyang. This is what we see also on the second mark put on the postcard. Michael also sent me a cover that I would like to show you. Here it is. The stamp in block of four is again a definitive stamp. It is a part of the same set that the one with the swans I mentioned above. It pictures a brown hawk-owl. The two other stamps have been issued on the 10th of December 2003. This set is a part of a joint issued with India, commemorating the 30th anniversary of diplomatic relations between both countries. Both countries have close ties since long through the exchanges of the Buddhist culture, but hey established diplomatic relations in 1973. The stamps pictures astrological observatories of both nations. 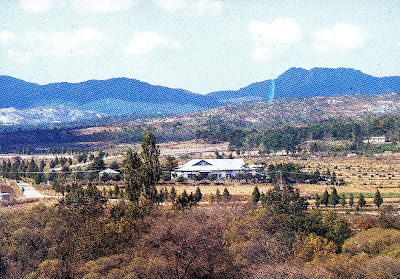 On the left the one located in Korea, Cheomseongdae observatory, is believed to have been built during the reign of Queen Seondeok (AD 623 to 647). This is one the oldest astronomical observatories of its kind in Asia. Ancient records show that people climbed to the top of the tower using a ladder to observe the skies and to study the movements of the celestial sphere. On the right, Jantar Mantar, the largest astrological observatory of India, was built from 1727 to 1728. It was built to observe the movements of the constellation, sun, moon and planets in consideration of the astrological rule, location of the equator, the latitude and longitude. For the record here are the stamps issued by India as a part of this joint issue. Another very famous authors of fairy tales is Hans Cristian Andersen, often referred as H.C. Andersen. HC Andersen was born in 1805 in Odense, Denmark. Very quickly he displayed great intelligence and imagination. In 1816, after the sudden death of his father in a fire, he started to work as an apprentice for both a weaver and a tailor. Later he worked on a cigarette factory. At the age of 14 he moved to Copenhagen and got enrolled as an actor in a theatre, mainly thanks to his soprano voice. When his voice changed, he had to stop his career as an actor and he decided to focus on writing. In 1822 he published his first story. He quickly met success in the area of literature. In 1835 he published the first part of his Fairy Tales, the work for which he is widely known. Follow other publications and a lot of travels. In 1872 he fell from his bed and never recovered, until he died painfully in 1875, near Copenhagen. In 2005 a lot of postal administration have commemorated the 200th anniversary of his birth. 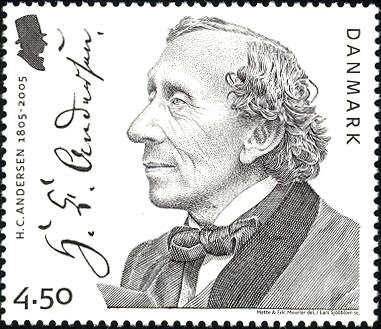 Danish post made no exception, of course and issued this very beautiful stamp picturing a portrait of Andersen. Among his fairy tales, we can mention some of the most famous : The snow queen, The little mermaid, The little match girl, The ugly ducking, The red shoes. I think a lot of kids in the world have one day heard about one tale from Andersen ! Among the most famous tales there is also Thumbelina, a tale that Andersen published in 1835 and which is inspired from the English folk tale Tom Thumb. Thumbelina tells the story of a little girl, who is not bigger than a thumb, and who is kidnapped by a toad (don’t worry the story has an happy end) ! You can read the full story on my website by click here. Thumbelina is pictured on one stamp issued by Denmark in 1997. The stamp pictures Thumbelina being saved from the bad toad by a butterfly. 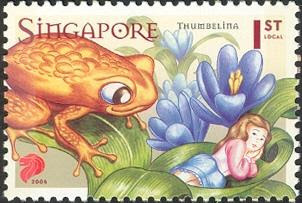 The toad and Thumbelina can be also found on a stamp issued by Singapore in 2005. 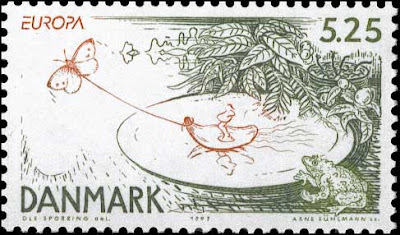 The stamp has also been issued as a part of a souvenir sheet illustrating other tales from Andersen : The ugly ducking, The emperor’s new clothes, The little mermaid. 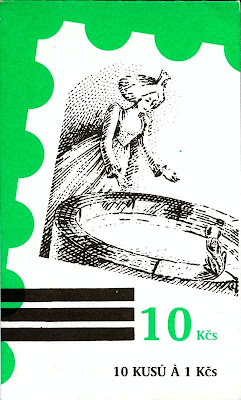 Another tale from Andersen contains a toad as a main character and is also pictured on a stamp. This tale, probably a little less famous, was published in 1866 and is entitled The toad. You can read the text of the story here. This tale is pictured on a stamp issued by Nauru in 2005, belonging to a set of four stamps commemorating the 200th anniversary of Andersen’s birth. As I’m a regular reader of sci-fi books, I have decided, quite some times ago, to start a collection of stamps about science-fiction. I quickly realized that this is a very narrow topic, and I must admit that my collection is not growing so fast. 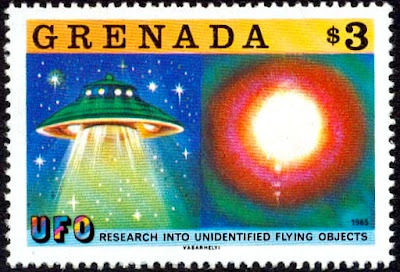 One of the sub-topic is UFO (or “flying saucer”) pictured on stamps. During the weekend, while trying to sort out the mess at home, I found back a set of stamps from Grenada that falls into this topic. And, as you will see, by a pure coincidence it also fits to my collection of “famous people named Eric pictured on stamps” ! 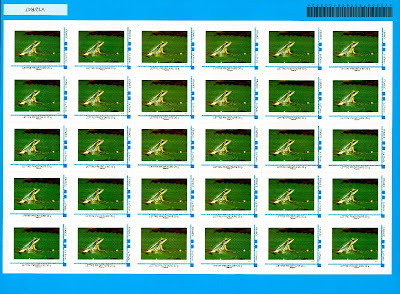 The set was issued on the 17th of August 1978. It contains three stamps and one souvenir sheet. Let’s have a look to the stamps first. Each stamp is divided in two parts : one on the left and one on the right. 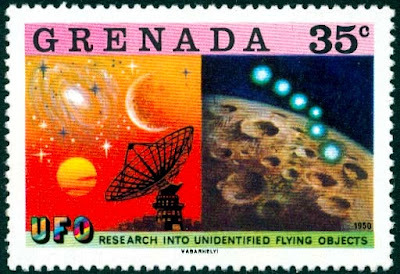 The first stamp pictures, on the right, a flying saucer as it appeared in a testimony in 1952. On the left side, the stamp pictures a woodcut dated from 1566 realized by Hans Glaser to picture a mass sighting of flying objects (spheres, discs and cylinders) that is supposed to have taken place in 1561 in Nuremberg ! The second stamp pictures a radar probing the skies, probably looking for evidence of an alien life, and the surface of Mars. 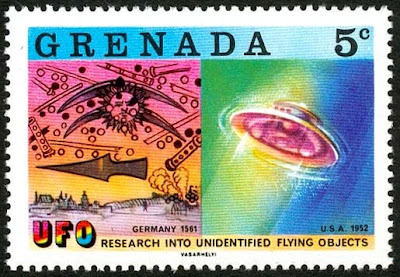 The third stamp pictures a flying saucer and a picture of an Unidentified Flying Object taken is 1965. Records of disc-shaped objects flying in the sky exist since the Middle Ages, but the first highly documented sighting is the one from Kenneth Arnold on the 24th of June 1947. This is this vision, as reported in the US papers, that launched the term “Flying saucer” which is still widely used. The term UFO was created in 1952, to try to reflect the diversity of shapes of flying objects. Reality or myth ? Alien ships or secret military planes ? Hoax or truth ? The existence of UFO is widely questioned and is the subject of many sci-fi books and movies. Now let’s have a look to the souvenir sheet of the set. It pictures a portrait of Eric Gairy and the UN assembly building. A date is printed on the margin of the sheet : 7th of October 1977. What is it about ? Eric Gairy (1920-1997) was a Grenadian politician who led Grenada as Premier or as Prime minister between 1967 and 1979. After being dismissed in 1979, he lived in exile in the United States. He attempted a come back in 1984 but failed to be elected at the head of the country. In 1977, Eric Gairy succeeded in getting UFO on the agenda of the UN General Assembly : his objective was to get from the UN the creation of an agency to “collate, coordinate and corroborate information” on UFO. He only obtained an agreement that any country with information or ideas on the subject should report to the UN secretary-general Kurt Waldheim. He tried again in 1978, but still without much success in motivating the UN assembly. Eric Gairy has reported that he has himself seen several UFO in Grenada ! 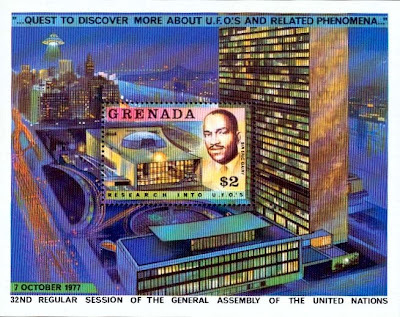 This set of three stamps and the souvenir sheet was issued to commemorate this proposal made by the Prime Minister of Grenada to the UN assembly. Another type of stories that often includes animals as characters are the fables, and more precisely the beast fables. In this domain, Jean De La Fontaine, a French fabulist, is very famous. Jean De La Fontaine was born in 1621 at Chateaux-Thierry, a small town located in the Champagne area. He started a career of lawyer, but turned to a literary career in his 40’s. In 1668 he published the first six books of the Fables. For writing these fables he took inspiration from famous predecessors, Aesop, Horace and from ancient Indian literature such as the Panchatantra. 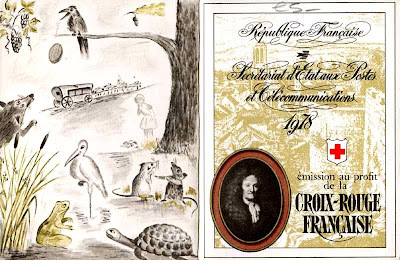 The first collection of 124 fables was dedicated to Monseigneur Louis, the six years old son of Louis XIV, the French king. His fables are short poems that always ends with a moral. He used animals to caricature the defaults of human being and to criticize the behaviour of some of his contemporaries. Jean De La Fontaine died in Paris, in 1695. His is pictured for the first time on this stamp issued in 1938 in a series about famous people. Among the most famous fables he has written I can mention : The crow and the fox, The wolf and the lamb, The lion and the rat, The cicada and the ant… A lot of animals appear in his fables, as illustrated on the cover of this booklet issued in 1978 for the Red Cross. As you can see, frogs appear in some of his fables : The two bulls and the frog, The frog and the rat, The frogs that claimed a king, The hare and the frog, The sun and the frogs… But the most famous one is surely : The frog that wished to be as big as an ox (sometimes known simply as The frog and the ox). A Frog saw an Ox that seemed to her of a noble size. Is this enough ? Tell me, am I there yet ? No - How about now ? - Not at all ! Is that it ? - You're not even close ! The pretentious creature swelled up so much that she burst. Interesting story, isn’t it ? 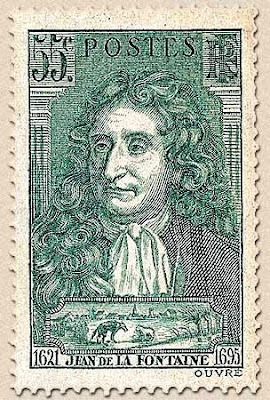 The frog that wished to be as big as an Ox is pictured on several stamps. 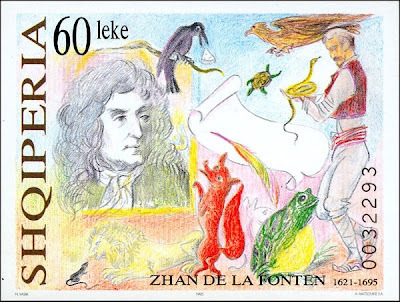 Indeed, in 1995, French post and Albanian post have commemorated the 300th anniversary of the death of Jean De La Fontaine by issuing some stamps. France has issued a set of six stamps issued in a se-tenant band, together with two labels. A set of pre-stamped envelopes has also been issued using the same design. Albania has issued the same year a set of three stamps and one label. The label and one of the stamps picture also the frog. To be noted that the stamp has been re-issued in 2006 with a surcharge of 40 leke instead of 25 (I do not have yet this stamp). Personnally I’m surpised that Albania has commemorated the anniversary of the death of Jean De La Fontaine. It makes me wonder how much is he known out of France. I would be happy to get some feedback on this from the readers of my blog. (This post is the first one in a series of articles that I plan to publish in this blog all over the summer). When I tell to non philatelists that I collect stamps picturing frogs and toads I always get the same reaction : people are surprised that the number of stamps picturing frogs could be large enough to allow a proper collection. 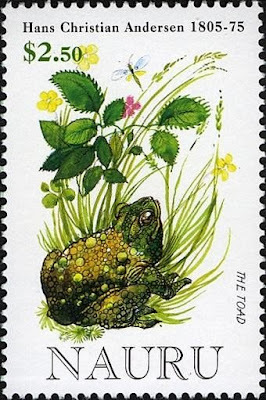 “I do not remember having seen a stamp from my country picturing a frog” is a standard affirmation I get during the discussion. But with more than 500 items, my frog stamp collection proves that this is not such an uncommon topic ! 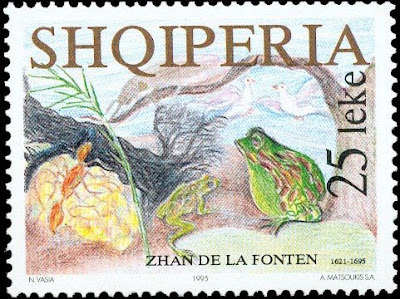 An interesting subset is the group of stamps picturing frogs as characters of fairy tales, folk tales, folk songs, poems or other stories. The purpose of this article is to make a (non exhaustive) review of such stamps. 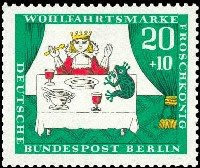 Among the tales that include a frog as a character that is pictured on a stamp, the most frequent one is : The Frog Prince, from the Grimm Brothers. 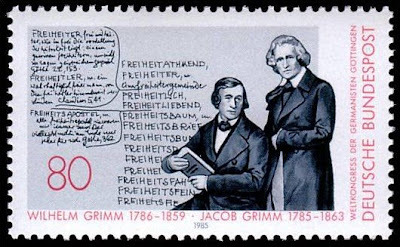 The Grimm Brothers published their first volume of fairy tales in 1812 under the title : Children’s and Household Tales. They had received these stories from peasants and villagers. Jakob was the one doing the research, while Wilhelm was more dedicated to giving a literary form to the tales. The first edition of their collection included 86 stories in the first volume and 70 in the second one. The first edition was much criticized : even if they were called children’s tales, they were not really suitable for children, because of the violence and the reference to sexuality that they contained ! They published further editions, applying some changes and also adding new tales, until reaching 211 tales in the seventh edition of their publication. Among the most famous tales published by the Grimm Brothers, you can find Hansel and Gretel, Cinderella or Little Red Riding Hood. The Frog Prince is the first tale of the first volume. It is also known as “The Frog King or Iron Heinrich”. This fairy tale tells the story of a young princess who looses her ball in a well. A frog helps her to get it back in exchange of the promise that the young girl would share her dinner and her bed with the frog. Once she gets her ball back, the girl runs to her house and forgets the frog. But the frog comes to the house to claim what was promised. The king obliges her daughter to keep her promise and so the frog is invited to have dinner with the princess and to share her bed. Upset and disgusted, the princess throws the frog against a wall, and suddenly the frog turns into a handsome prince ! You can read the full text of the story on my website (you will then understand the reference to Iron Heinrich which appears in the original title). More modern variations of the same story have changed the way the transformation of the frog is triggered : the princess kisses the frog instead of throwing it against a wall ! This is in this modern form that the story is widely known. And this is in this form that I discovered it when I was a kid. 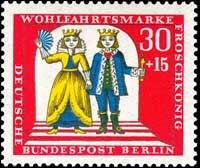 This fairy tale is the subject of a complete set of four semi postal stamps, issued by Germany (and also by Berlin Post) on the 5th of October 1966, bearing a surtax for charitable organizations. Each stamp picture one scene of the tale; the frog appears only on the two first ones. Berlin 1966, Scott #9NB41. The princess meets the frog. Berlin 1966, Scott #9NB42. The princess shares a dinner with the frog. Berlin 1966, Scott #9NB43. The frog turns into a handsome prince. Berlin 1966, Scott #9NB44. The prince and the princess get married. 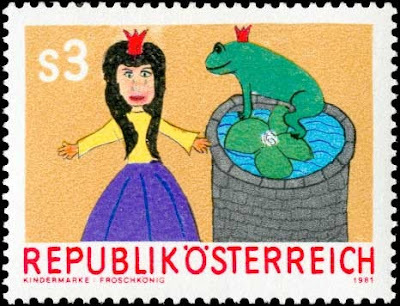 The encounter between the princess and the frog is also pictured on a stamp from Austria issued on the 29th of June 1981. 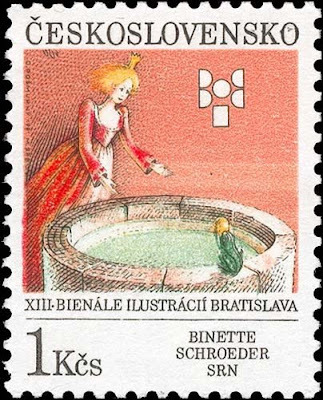 The same scene is used on a stamp from Czechoslovakia issued on 2nd of September 1991 for the 13th exhibition of children's book illustrations in Bratislava. The stamp being issued in booklet, the cover of the booklet re-uses the same design. 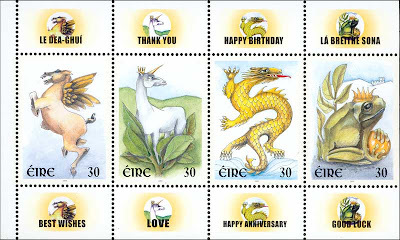 A crowned frog (that we can associate to this tale) also appears on a message stamp from Ireland issued on the 26th of January 2000 and included in a booklet pane. 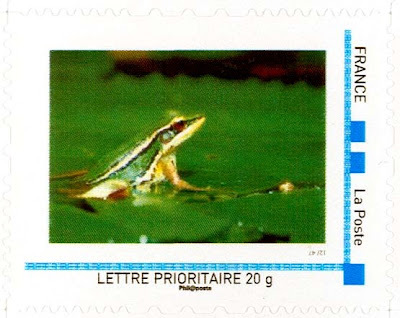 Just to be complete, a crowned frog also appears on a stamp from Netherlands issued on 11th of November 1980. 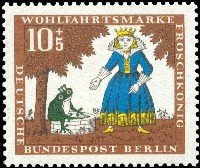 This stamp picture a young girl reading “The Frog Prince”, with the crowned frog getting out of the book. I unfortunately don’t have yet this stamp in my collection so I can not show it to you. 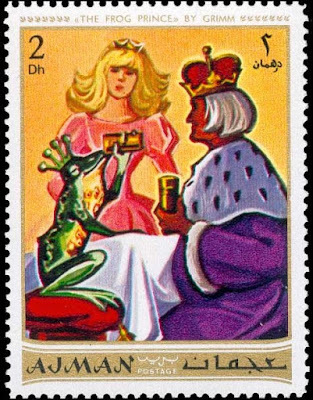 The Frog Prince is somehow related to another tale called The Frog Princess, which is pictured on other stamps and that I will mention is a future article. 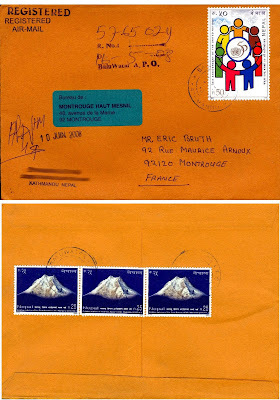 I have received at the same time two different covers from Nepal, sent by two different persons, and they appear to have a link together. This is a funny coincidence. Here is cover #1, this is a registered one. I show you the recto and the verso because both sides bear some stamps. The link between both covers ? In fact the two stamps picturing a mountain belong to the same set. This is a set issued on the 9th of May 2006. The stamp on cover #1 commemorates the golden jubilee of the first ascent of Mount Manaslu whereas the stamp on cover #2 commemorate the golden jubilee of the first ascent of Mount Lhotse. Mount Lhotse, which is located between Nepal and Tibet, in the shadow of Everest, has a height of 8516 meters and is the fourth highest mountain in the world. Its first ascent was made by two Swiss mountaineers, Fritz Luchsinger (1921-1983) and Ernst Reiss (1920-), on the 18th of May 1956. 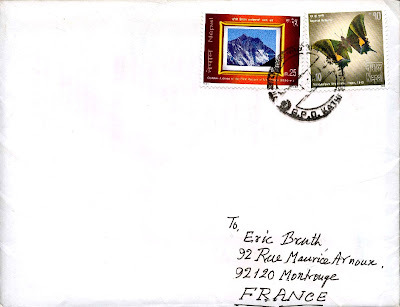 The sender of cover #2 is collecting all philatelic items related to the mount Everest and its ascent. If you have any unusual item related to it (he has already an impressive collection) then just let me know. I will establish the contact between both of you. The other stamp on cover #1, the large one, was issued on the 22nd of October 1995 to commemorate the 50th anniversary of the creation of the UN. During the closing days of the Second World War, representatives of 51 nations attended the UN Conference on International Organization in San Francisco and signed the UN Charter. This event brought the Organization into existence on 24 October 1945, the day now known as United Nations Day. To commemorate the 50th anniversary of UN, in November 1995, a UN flag was carried into outer space by the astronauts of the Space Shuttle Atlantis, to salute United Nations work for the peaceful uses of outer space. And finally the last stamp of cover #2 belongs to a set issued on the 12th of June 2006 and dedicated to bio-diversity. This set contains four stamps, I have already written about it in a previous post. The stamp pictures a Kaiser-I-Hind (Teinopalpus imperialis, Hope 1843) which is a rare species of swallowtail butterfly native to India. Its common name means Emperor of India. This butterfly is endangered because much sought after by butterfly collectors for its beauty and rarity. 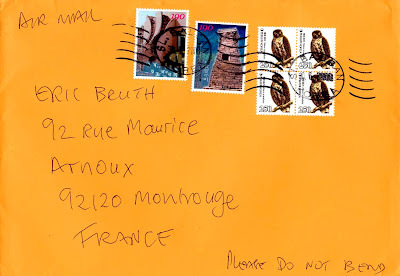 As a contrast to the cover shown in last post, here is a cover franked with an interesting number of stamps. This is a registered cover I received from Lithuania and that contained a set of stamps that I purchased on an auction website. I’m always pleased when the seller uses nice stamps on his/her cover when sending the item that I have won. 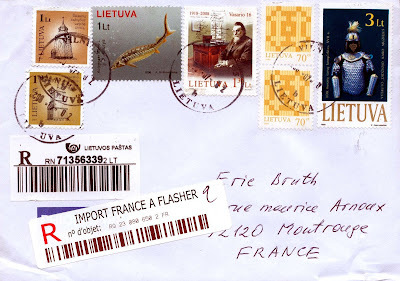 First of all, as you can see, the cover bears two registration labels : one from Lithuanian post (the one with the black R) and one from French post (the one with the red R). The label from French post is so “well” stuck that it hides partially my address ! Not less that seven stamps have been used on this cover, a mixture of definitive and commemorative stamps. Let’s go from the left to the right. 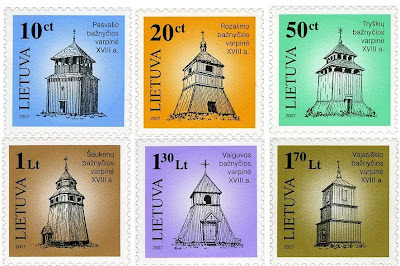 The two first stamps belong to a set of six definitive stamps issued on the 2nd of January 2007 and dedicated to Wooden Church Belfries. The 1 Lt stamp pictures the belfry of Shaukenai church, whereas the 1.70 Lt pictures the belfry of Vajasishkis. The stamps of this set are rather simple but rather nice. 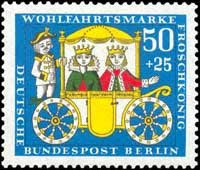 They have a square shape, which is not so common for definitive stamps. Here is a picture of the full set. The next stamp is a part of a set of two issued on the 16th of September 2006. This set pictures sea fauna that is part of the Red Book of Lithuania. The stamp pictures a European sea sturgeon (Acipenser sturio) also known as the Baltic sturgeon. This species of fish is critically endangered. The other stamp of the set pictures a Stellers eider (Polysticta stelleri). Here is a souvenir sheet issued with both stamps of the set. Going further to the right, we find a stamp issued on the 16th of February 2008 to commemorate the 90th anniversary of the restoration of the State of Lithuania. Effectively, on the 16th of February 1918 an act was signed to declare the independence of Lithuania (that was shared between Russia and Prussia before this treaty). The stamp pictures Jonas Basanavičius (1851-1927), who was one of the signatories of the Act of Independence of Lithuania and who is often referred as the Patriarch of the Nation. 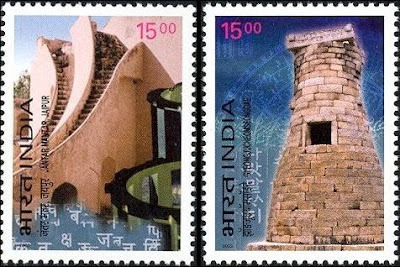 The next two similar stamps belong to the definitive issue of 1999. Issued on the 14th of April 1999, the stamps picture a double cross, which is a symbol that can be found on the coat of arms of Lithuania. It is also the shape of the Cross of Vytis, the Lithuanian Presidential Aware that is conferred to people who heroically defended Lithuania’s freedom and independence. As far as I could see this definitive series started in 1997. Finally the last stamp, on the right side, is part of a set of two stamps issued on the 9th of October 1999. This set is dedicated to museum exhibits. 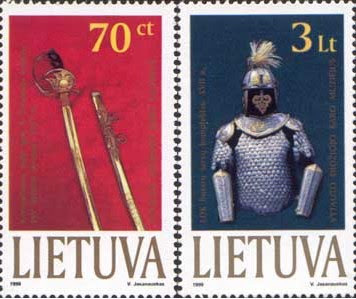 The stamp pictures a protective uniform of Lithuanian warrior from the 17th of century. Here is a picture of the full set, the second stamp picturing a sabre dated from 1927. The long weekend is over… I had a very nice time in Reims. I haven’t much time in front of me but I’m happy to share with you my first cover from Cuba ! Nothing really exceptional, as you will see, but this is the first time I get mail from this country. 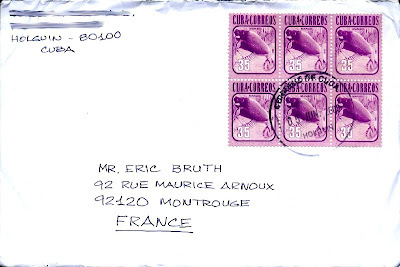 The cover is franked with a block of six similar stamps. This stamp has been issued on the 14th of December 1981 in a set of six stamps about Fauna. From the design I have the feeling that this set was a set of definitive stamps but I’m not completely sure of that. I could not find a decent scan of the full set so I can not share it with you. The stamp used on the cover pictures a manatee. This big animal is sometimes called a sea cow. In average its weigh is around 500 kg and its length is around 3 m ! A baby weighs 30kg at its birth ! The manatee is an herbivore. It differs from the dugong : the dugong has a forked tail whereas the manatee has a paddle-shaped tail. The manatee is sometimes considered as the origin of the legendary mermaids ! The same design has been re-used for a set of stamps issued in March 2005 : in this set the 15c stamp pictures the same manatee but using a brown colour instead of the purple one. My flight back from Germany has been highly disturbed because of a strong storm that just arrived few minutes after I posted my last article… I’m currently in Reims, enjoying a three days weekend (tomorrow is the 14th of July, the French National Day) in the capital of Champagne ! I have decided to share with you a cover from Ukraine. This is not the first one I get from this country but this is the first I show here on my blog. 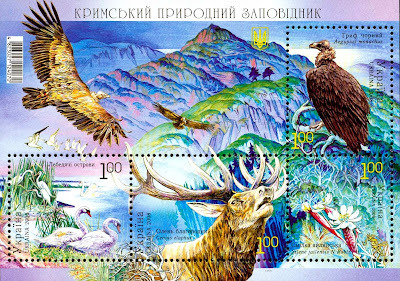 The two stamps located on the right side belong to a souvenir sheet issued on the 18th of June 2008 which celebrates the diversity of fauna and flora of the Crimean natural game reserve. The send of the cover was very nice, he included a copy of the souvenir sheet in the envelope. Here is a picture of the full sheet. As you can see, there are four stamps in the souvenir sheet, picturing each of them a different species. The stamp on the first row pictures a vulture : the Eurasian black vulture (Aegypius monachus), which is also known as the Monk vulture because of its bald head. With a length that can go up to 100cm and a wingspan that goes up to 300 cm it is the largest bird of prey in the world. On the second row, from left to right, the stamps picture : swans (surprisingly this stamp is the only one that does not include the Latin scientific name of the species ! ), a red deer (Cervus elaphus) and a flower called Silene jailensis (I think it has no common name). 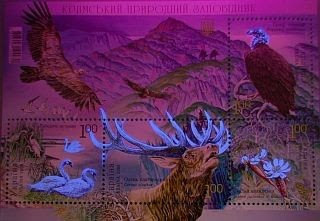 There is a funny security measure on this souvenir sheet : some parts of the animals or plants glow under UV light as shown on this picture. The two other stamps on the cover are part of the seventh definitive series dedicated to objects. The top stamp, issued on the 15th of February 2008 pictures a tobacco pipe. The second one, issued on the 6th of April 2007 pictures a jug. You can notice that the design of the souvenir sheet and of both stamps contains a trident, which is a part of the coat of arms of Ukraine that you can see below, in its official colours. As I’m Germany I decided to show a cover from Germany today. A very simple (since it bears only one stamp) but rather nice. Here it is. Before speaking about the stamp, just look at this very nice and clean postmark from Munster. I’m really impressed ! The stamp has been issued on the 7th of September 2006 to commemorate the 650th anniversary of the Hanseatic league. It is a part of a joint issue with Sweden. I have already written about the Swedish issue in a previous article, because it picture St Erik ! Just click here to read about it. 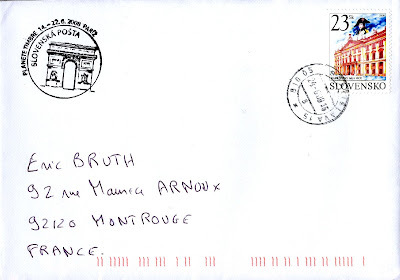 This cover was sent to me by another stamp collector. Inside the cover there was a very nice souvenir sheet containing four stamps, that I really wanted to show you. This souvenir sheet was issued on the 14th of June 2007 to celebrate the 175th anniversary of the birth of Wilhelm Bush. Wilhelm Busch (1832 - 1908) was a German caricaturist, painter and poet who is known for his satirical picture stories. He is still regarded as one of the most humorous poet and illustrator in Germany. One of his first picture stories, Max and Moritz (published in 1865), was a huge success. Max and Moritz as well as many of his other picture stories are regarded as one of the main precursors of the modern comic strip. The comic strip illustrated on this souvenir sheet pictures Hans Huckebein a troublesome raven. Below the stamps a short poem in German tells the story of Hans Huckebein, who eats part of the compote prepared by Aunt Lotte. When she discovers this, Aunt Lotte is upset and makes him flee. But why fleeing he walks in the compote and spoils the clean clothes that Aunt Lotte just ironed ! It seems that Hans Huckebein is a recurrent character that could be seen in various strips from Wilhelm Bush. I really like this souvenir sheet, it is really beautiful. Thanks again Uwe for having sent it to me ! I recently had a very interesting discussion with a charming lady who belongs to a philatelic association to which I also belong. She explained me how much she dislikes souvenir sheets. She agreed that they often provide a very nice design but, as she told me, they are not real postal items because you never see them on a cover. This is true that French post issues huge souvenir sheet that you can hardly use on a cover, and they are very often hard to tear to get out the stamps without damaging them. Some foreign postal administrations issue souvenir sheets that contain only one stamp, and therefore that have a reasonable size. Reasonable enough to be used on a cover. This is the case for Spain. Here is an example of a cover I got recently. 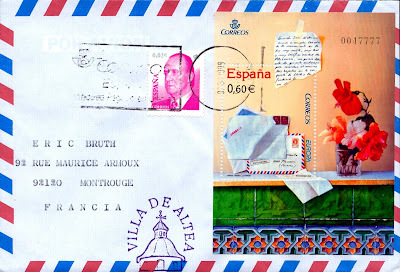 The single stamp is a part of the definitive series picturing King Juan Carlos. This specific stamp was issued on the 2nd of January 2004 if I’m not wrong (surprisingly Spain has re-issued a 0.02 € stamp in January 2008 bearing the same design but with the denomination in yellow/gold instead of grey and the crown on the left top corner instead of the right top corner… I wonder why these changes ?). The most interesting is of course the souvenir sheet. It was issued on the 23rd of April 2008. This is the 2008 Europa issue of Spain. I remind you that the subject of 2008 Europa issues are “writing letters”. So the Spanish postal administration has issued this rather nice artistic composition around letters, and more precisely around love letters ! I have written already about my visit to the stamp fair held in Paris in June. During this visit, I took the opportunity of the presence of foreign postal administrations to send some mails to myself, so that it get cancelled in the associated country. Last weekend, I have received part of the covers I have posted to myself and I wanted to share them with you. The first one if from Slovakia. I have already shown some stamps that I bought on the Slovakian post booth but here is the cover I sent, using a single stamp of 23 Sk, the standard rate for a letter from Slovakia to France. The stamp I used on the cover is a definitive stamp issued on the 29th of April 2005 commemorating the 200th anniversary of the peace of Pressbug. The Peace of Pressburg (the former name of Bratislava) was signed on December 26, 1805 between France and Austria as a consequence of the Austrian defeats by France at Ulm (September 25 – October 20) and Austerlitz (December 2). This peace treaty is also known that the Fourth Peace of Pressburg. The treaty marked the effective end of the Holy Roman Empire. The last Holy Roman Emperor, Francis II became instead, Francis I Emperor of Austria and a new entity, the Confederation of the Rhine, was later created by Napoleon. The stamp pictures the façade of the Primate’s Palace where the treaty was signed by Johann I Josef, Prince of Liechtenstein, Ignácz Gyulay and Charles Maurice de Talleyrand. The stamp also pictures a small portrait of Napoleon. The Primate's Palace is a neo-Classical palace in Bratislava's Old Town. It was built from 1778 to 1781 for Archbishop József Batthyány. 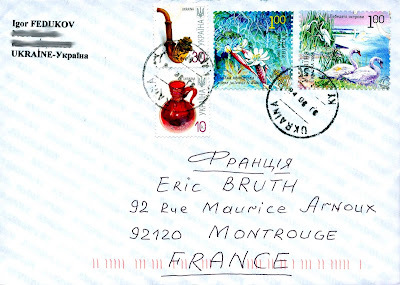 The stamp is cancelled with the postmark of Bratislava, and you can see also the commemorative cancel designed by Slovakian post for the stamp fair in Paris, in the opposite corner. This cancel pictures the “Arc de Triomphe” one of the very famous monument of Paris located on the top of the avenue of Champs Elysées. The second booth I visited and from which I sent a cover to myself is the one of the Italian post. For this one I chose the wooden stamp that I have already presented on my blog. 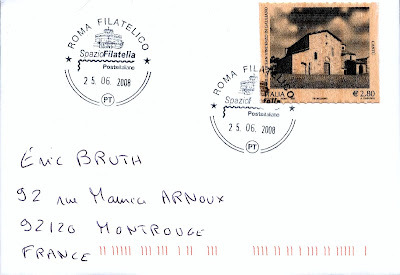 The nice postmark is the one from the philatelic bureau of Rome. Finally I also visited the booth of the “Poste interarmées” (the military post) from where you could ask to receive a postcard that was cancelled in Lebanon with a slogan cancel. 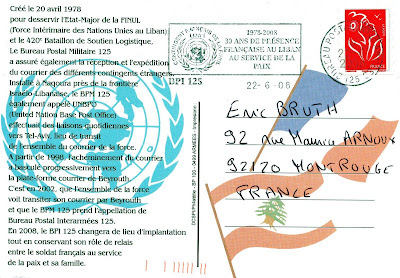 This cancel celebrates 30 years of presence of French army in Lebanon to preserve peace. I’m not so much into military things and military philately is not really my cup of tea, but I thought it was a good opportunity. This sort of slogan cancels are becoming more and more scarce in France, since French post has decided to replace them by standard cancel, without text. Like a lot of postal administrations, the French post proposes, since several years, the possibility to personalize stamps. Up to now it was only possible to personalize a label attached to a normal stamp (see here an example I presented with my own portrait ;-) ). Since now several months, we also have the possibility to personalize the stamp itself. This is a service which is called “Mon timbre à moi”, that I would translate as “My own stamp”, and which is available through this website. Just for the fun I decided to try this service, and I would like to share with you the result. I did not dare using my own picture to be printed on a stamp so I decided to use a picture of one of my favourite subjects : a frog. Once you have chosen your picture (you can choose a picture in a gallery or upload your own picture from your PC), you choose the format of the stamp (landscape or portrait). Then you can adjust the picture so that it fits what you want. Then you can select the rate of the stamp you want to create : I chose a rate for a standard letter of less than 20g for France (which corresponds to 0.55 Euro). I chose to have a sheet of 30 stamps (you can choose a sheet of 10 stamps). The more sheets you buy, the cheaper it is…Here is the result. And a close up of the stamp. The final result looks better in reality than on this scan. The stamps are self adhesive, of course. I could have added some text on the picture if I wanted. Rather funny, but rather expensive. For a sheet of 30 stamps, it costs 30 euros, meaning 1 Euro per stamp with an equivalent face value of 0.55 Euro ! The personalization has a price ! I will add this sheet of stamps to my frog stamps collection, just for the fun. This possibility of personalizing stamps raises some questions : are they collectible items ? In which way should they be collected, since everybody could issue their own copy ? Of course there are some controls on the picture you use to create the stamp. But I guess that in France there will be some errors, like in other countries. To finish, just an anecdote about those types of stamps. Last time I went to a philatelic bureau, a customer (a young lady who was going to get married soon) was explaining to the clerk that the French post had refused to print the stamps they had designed because the picture included a glass of wine ! In France you can not “publish” any representation of alcohol without adding the notice : to be consumed with moderation ! The worse is that, in reality, the glass on the picture was full of Apple juice and not wine (at least this is what she said ;-) ).